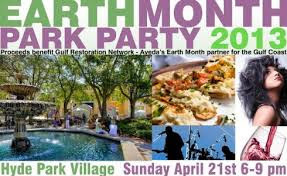 Come join us Sunday, April 21st in Hyde Park located in Tampa, Florida for the Aveda 2013 Earth Month Park Party from 6pm to 9pm. The event is hosted by Level Aveda Salon a popular Aveda salon in the Tampa Bay area. We have been invited to participate in the Hair/Fashion show that will be the main entertainment of the party. The theme is elements of nature, so the models must represent either wind, water, earth or fire. All proceeds from the event will go to the Gulf Restoration Network. GRN is a non-profit foundation that focus on clean water projects in the lower regions of the United States. Local businesses, restaurants and musicians will be donating their services and food to the event. Tickets to the party start at $25, but they are also offering $50 VIP tickets which allow you to get access into the party with free drinks and food all night.